As one of the 100 most endangered sited in the world, Leh’s Old Town has been left in ruinous conditions by haphazard urbanisation. 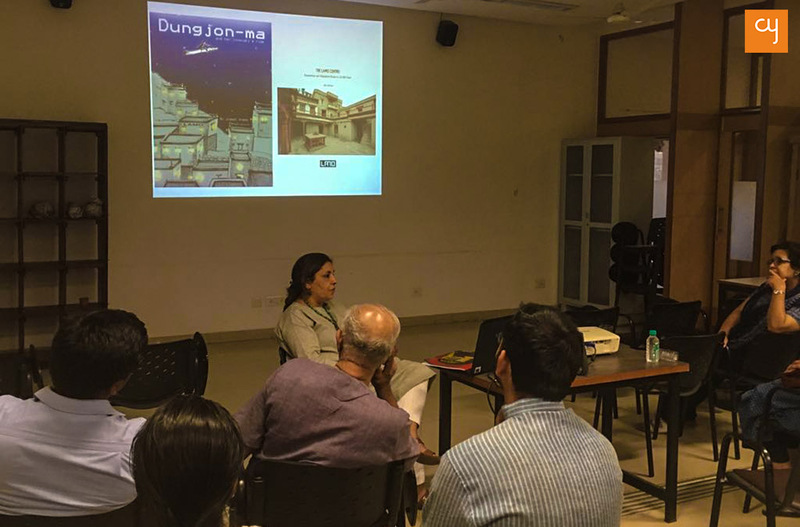 Monisha Ahmed, co-founder of LAMO art centre in Leh, spoke about LAMO’s restoration work, at the Centre for Heritage Management, Ahmedabad. The treeless and cold desert of Leh was once a bustling crossroads between the merchants of Kashmir, Punjab, China, Russia and Tibet. Tea, sugar, pashmina wool and opium was traded in abundance. “Leh, and especially its pedestrianized Old Town, was a cosmopolitan city having sophisticated roads and roofed tunnels which remained open even after heavy snowfall,” said researcher Monisha Ahmed, who was invited by the Centre for Heritage Management, Ahmedabad, on March 7 to talk about the Ladakh Arts and Media Organisation (LAMO). As an independent researcher, with her PhD from Oxford University, and co-founder of LAMO, Ahmed has worked greatly on preserving the arts of Ladakh. She went on, “The contemporary haphazard urbanisation has transformed the Old Town into a slum. Today, the aesthetic styles of Tibetan architecture and Mughal decor design are evident only in the doors and window carvings of the houses of Old Town,” The centuries-old town, because of its ruinous conditions, has been named as one of the 100 most endangered sites in the world, in the ‘World Monuments Fund’ list. “In 2017, the last bit of the old wall of the Jama Masjid was destroyed,” she added. Ahmed further elaborated on some of the centuries-old local houses which have been sabotaged here. The Munshi house and Gyaoo house, which were once abodes of the Munshi family who were ministers to the king, have been restored by LAMO in the recent past. At the time that the organisation’s team took these houses up as a project, they were in shattered conditions. The Munshi family abandoned it in the 1980s, and its wood, which is a crucial commodity for the locals, was all taken away by the people. This is much like what happened with the Chiktan Fort in Kargil district, which gradually led to it being destroyed. With the assistance of locals, architects revamped the two households, which stand adjacent to each other, and developed them into LAMO, an art centre where local as well as foreign artists and artisans can practice and exhibit their arts. The restoration work took more than five years. Innovations in exterior elevations were made keeping the originality of the structure in mind. The Centre has a conference room, office, library, reading area, screening arena, and an open-air performance site with the massive Leh Palace in its background. Besides focusing on the deteriorating conditions of the heritage in Leh, Ahmed also spoke about the iconic 16th century kings of Lechen Pelkhar (Leh Palace) who ruled the dynasty and controlled trade, and the many time-honoured monasteries which still evoke spirituality in Ladakhi residents. The team at LAMO is meticulously working on revitalising the heritage of the town to preserve its cultural practices and assets. Their current project is based on mapping the Old Town area and its neighbourhood. The Centre accepts applications for internship, if you wish to contribute to this work happening in the Himalayan foothills.